Have I had my head buried in the sand for the last few years? How is it possible I have never before heard of Josh Ritter? Better late than never, I suppose. And what better time to discover this ridiculously talented artist then tonight, at the Central Park SummerStage kickoff event. The charismatic Josh Ritter -- backed by the iconic New York Pops -- accompanied by guest violinist Hillary Hahn -- a gorgeous poem read by author Mark Strand -- and the icing on the cake: a surprise appearance by my favorite contemporary artist, the great Glen Hansard. Forget Summer Solstice. 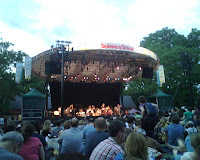 In my book, the opening of the SummerStage concert series marks the official start to summer. As if on cue, the skies cleared tonight after a long and dreary week of rain. The park filled with adoring fans. Josh and company rocked the stage. And as I have done so often in the past, I began to wonder how I could ever consider leaving this great city. and the dark become desire, and desire the arriving light.